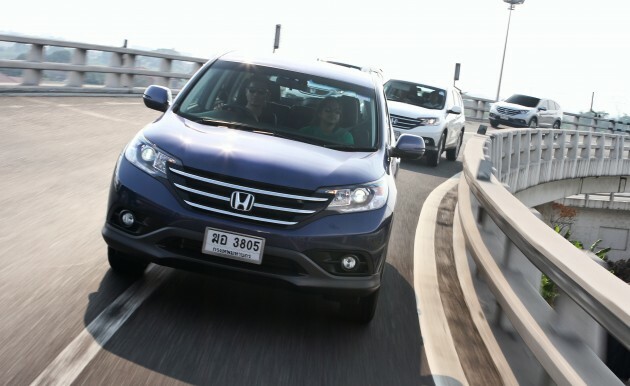 With more than five million examples sold in the last 18 years, the Honda CR-V, that erstwhile comfortable runabout vehicle, has been every bit the success story, and in recent times very much the class-defining compact Japanese SUV act. Not bad, considering that the first stab at it with the original RD1 from 1995 was a bit of a shot in the dark; rough around the edges, the company’s first own-designed sport utility wasn’t all that elegant, but it did provide an important stepping stone for the brand. The second one, also a RD but with a four suffix attached, was certainly a better fleshed-out offering, but the boxier design was still more utilitarian than pretty, lacking outright charm and grace. The jigsaw finally fell into place with the RE, and it is with the outgoing third-gen machine that the CR-V name is defined in the eyes of the consumer. Here at last was the Honda compact SUV all grown up – more car-like in its driving feel and dynamics than its predecessors, with plenty of refinement and perceived value, the RE sold, and it sold well enough to see off the competition through the early days and into the facelift, which arrived in 2010. With rivals’ offerings firming up, however, led by the likes of the Mazda CX-5, that hold has begun to wane, and the arrival of the fourth-generation RM is timely for the brand. The question is, does the fresh face have what it takes to remain the benchmark? Let’s find out. The third-gen isn’t quite broken, but with tastes ever changing and the clamour for a fresh view always hovering about, reinvention has been necessary. As such, number four represents a change in outlook – the development concept has evolved from the ‘urban comfort driving’ of the outgoing CR-V to what the company tags as a ‘premium smart SUV’. What this really translates to is a five-seater sport utility vehicle with MPV-esque/crossover leanings and even more car-like driving dynamics. Apparently, the pursuit of the perfect balance between a car and an SUV influenced every element of the development process, including the exterior styling. Shape-wise, it’s not revolution, but the curvy rounded vessel has been replaced by a far tauter appearance, obviously inspired by the competition as well as demands of the day. The rakish silhouette is winsome upon first glance, especially the rear, ignoring that rear lamp assembly and the suggestion of Volvo XC 60 in it. The lower cab profile offers a more squat stance, and that front end is beefy, to say the least. Taken on its own, it’s not that noticeable, but park it next to the third-gen and you’ll see a higher nose and a pretty bulky face, led by an imposing three-bar grille. Elsewhere, the side fenders are bolder, and a shark fin antenna streamlines things further. The CR-V gets new design alloys too, still 17-inch five spoke units, but now wider at 17×7 than the 17×6.5 previously, wrapped with 225/65 tyres. Aerodynamic improvements abound, from optimised angles for the front bumper and rear end as well as rear spoiler to the inclusion of expanded under covers on the bottom of the car and sculptured wheel-arches. The new CR-V looks leaner and more athletic, and in terms of measurements stretches the tape at 4,545 mm long and 1,685 mm tall. The dimensions don’t veer off too much from the outgoing RE, but I’m a bit puzzled to the height measurements; the third-gen is listed at 1,680 mm tall, and the new one is supposed to be 30 mm lower, which should actually make it 1,650 mm. 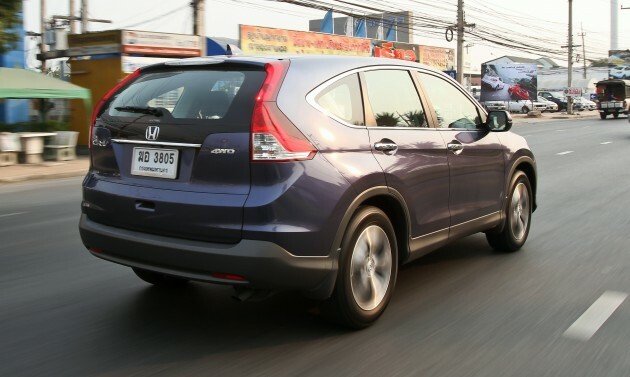 The side-by-side pix here of both current and new CR-Vs taken during the Thai drive does visibly show up a height difference. No change to the width from the outgoing model, which remains at 1,820 mm, or to the wheelbase’s 2,620 mm, but front and rear overhangs have been reduced by 10 mm and 15 mm respectively. Interior width has also been increased, with 75 mm more space to be had, door-to-door. Other numbers, since we’re at that particular game. Ground clearance is 170 mm, while kerb weight is 1,540 kg (for the 2.0 litre). The seating position is now lowered by 30 mm, but offers the same eye-height viewpoint as the third-gen. The steering diameter has been reduced by 10 mm to 370 mm, and in terms of boot capacity, there’s 589 litres of cargo space, extending to 1,648 litres with the rear seats folded down, good enough to get a couple of mountain bikes in. Five colours are available for the Malaysian market – retained are Taffeta White, Crystal Black, Alabaster Silver, and Polished Metal, with a new shade called Twilight Blue replacing Urban Titanium in the palette. The blue in particular works well on the SUV. So far, so good. Move inside, and the new interior looks sharp upon first glance. The new instrument cluster is easy on the eye, and traditionalists will like that the fuel and temp gauges are now back to analogue, sitting in their own space to the right of the large speedometer. The dashboard now displays more angular lines, and a five-inch colour LCD intelligent-Multi Info Display (i-MID) sits top centre, and offers readouts of audio display, fuel consumption or an ‘analogue’ clock, also doubling up as a viewing screen for the rear camera that comes standard with the vehicle. New items include an Econ function button and rear air-con vents in the centre console, a welcome addition, and the headlamps now come with a 15-seconds auto-off function if you forget to switch the beam off. The steering wheel audio/cruise control switches have been retained, but have been updated in layout shape. Elsewhere, the rear seat head rests can now be folded in addition to height adjustment, and the rear 60:40 split seats are fully foldable in tumble-down fashion, accomplished in a single-motion through the pull of a lever. The new CR-V will be available here in two engine variants, the familiar 2.0 litre form that’s being launched later today as well as in 2.4 litre guise, which will be introduced closer to mid-year. Differences include seat material – the 2.0 litre wears a new suede fabric design, while the 2.4 comes dressed in leather. Both are finished in black. The 2.0 litre gets a standard CD/six-speaker audio system with reverse camera, while the 2.4 will come with an integrated two-DIN 6.1-inch colour QVGA (480 x 234 resolution) touchscreen with Garmin navigation and RDS. The 2.4 also features more kit, naturally. There’s rain sensing wipers, paddle shifters, 18-inch five twin-spoke alloys, eight-way power seats, Bluetooth telephone connectivity, HID headlamps and fully keyless entry/push-start ignition. Meanwhile, the 2.0 litre continues to make do with a keyed ignition, but the key has been updated to a jack-knife design. Doesn’t sound too bad, does it? After a while though, it isn’t as rosy as painted. Given that the vehicle’s fundamentals are utility and functionality, some design cues raise the question of whether form has taken precedence over function, and elsewhere, some areas look lacking or haven’t really been advanced from the third-gen. The third-gen model is very familiar, simply because we happen to have one at home, a 2010 facelift version, and this was the CR-V utilised in our five SUV shootout in 2011. The other half loves its interior and the practicality it offers, none more so than with the void space between the centre console and fascia; great space for a handbag, shoes, even the odd small umbrella. Also great for a driver changeover from the passenger seat without having to be too unladylike, as observed on many an occasion. Well, that unique layout is gone. The new CR-V goes the traditional route by joining up the console and fascia, and the redesign removes the space, as well as the two cupholders and flip panel/slide cover storage bins of the centre console. Replacing it is a single console offering three cupholders and a storage box/armrest. You do get two 12V power receptacles (one tucked away in the storage box), and the USB connector has been relocated – from the flip-lid storage space on the dashboard on the passenger-side – to a more accessible location within the storage box, but the old system worked as well, if not better from a compartmentalisation point of view. Three cupholders seems like overkill, even for the thirsty, and that storage box isn’t all that big, really. Most importantly, the sense of spaciousness and freedom around the knee area is gone with the arrival of the new centre console. I suppose if you’re attempting to introduce ‘more car-like driving’ as a selling point, then it makes sense to lay things out car-like as well, but I get the feeling many are going to miss that space. Some other elements also don’t quite measure up under close scrutiny. The lack of Bluetooth telephony in this day and age is a noticeable omission, as are DRLs in the scheme of things, even if not having HIDs – for the 2.0 – is forgivable. Elsewhere, the new audio system panel looks less classy than before; where the old was elegant, especially lit up at night, the new one is much less so. Those big buttons don’t help any. There’s also less of a sense of occasion than before. The new interior’s design and fresh layout masks it well enough, but vis-a-vis the third-gen the materials feel less premium to sight and touch. The door panel armrest shows it up best – where the old was clothed, the new has an expanse of bare plastic, and not the least textured at that. And that silver finish on the dash decorative strip and gear lever surround panel doesn’t look too hardy. In defense of it all, the design of this CR-V came about during trying times, with the economic downturn of a few years back probably shaping prudence and conservative thought; witness the current ninth-gen Civic, with which the new CR-V shares common ground, as an example of this. The rest of the vehicle doesn’t cut back on things, but in terms of finish, the corner-cutting has become more noticeable in the face of toughened competition offering more in the way of kit and dress. Still, aside from some questions asked about design cues and material choices, areas like safety and NVH haven’t been skimped on. Like the current CR-V, the fourth-gen comes with dual front and dual side airbags, making for four, as well as VSA, ABS and EBD, but the evolved VSA system now includes traction control and hill start assist. The current vehicle didn’t come with Isofix points on the rear seats, but the new CR-V now has them, good news for those needing such mounts. In other areas, the centre rear passenger now gets a three-point seatbelt, and structural improvements include a stronger roof and supporting pillars. As for NVH, the new CR-V feels decidedly quieter and more refined than its predecessor, something that was evident very quickly during the drive from Pattaya to Bangkok. Improved sound insulation and sound absorption materials find their way on to the firewall, floor, inside door panels and tailgate lid as well as inside the rear fenders, and a sound isolating lower seal has been added as well. Three dB less than the third-gen in the 500Hz-5kHz region – coupled to improved absorption values across the range – might not sound like much, but in actual conditions is noticeable, translating to a more comfortable and quieter experience. Another area of improvement is with takeup from standstill, the 2.0 litre mill from the Civic injecting some welcome pace off the line. With 155 PS at 6,500 rpm and 190 Nm at 4,300 rpm, there’s only a marginal increase in output, but the perkier character of the R20A lends the new CR-V a brighter nature and makes it feel less cumbersome. The 2.4 K24A, meanwhile, feels decidedly lazier than the 2.0 in stop-start and low-speed conditions, but shines when given space and enough throttle input. The 190 PS at 7,000 rpm and 222 Nm at 4,300 rpm lump’s midband has a silkiness to it missing from the smaller displacement unit, and it retains its composure far better when pushed. As for the five-speed automatic that both versions wear, nothing negative to report – it really doesn’t miss an extra cog, with clean operation and good transition aspects evident. The McPherson strut front and multi-link rear suspension geometry remains unchanged, though it has been upgraded with a 10% increase in damper volume. The ride is perceptibly that bit firmer on the 2.0 litre over its predecessor, but is still supple, and aided by the improved NVH makes for an able long-hauler. I can’t visualise how the 2.4’s measures up against before, but it’s noticeably harder riding than the 2.0. Given the strong emphasis on sedan-like driving characteristics and good driving performance, it’d have been interesting to put the CR-V to the test beyond the scope of highway running. A quick jaunt revealed the hint of a keen and agile nature, and you get the sense that its composure and thresholds improve on the third-gen’s by a fair bit. We’ll have more to report on this when the CR-V eventually comes in for review. I’m undecided about the steering on this one, though. The switch to a motion adaptive EPS from the existing hydraulic power-assist system does offer a faster and lighter rack, which is great for town use. It is however devoid of sensation when it comes to on-centre feel and gets twitchy when off-centre, and this vagueness takes some shine off the improved dynamic capabilities elsewhere. The existing hydraulic rack is so much better in terms of feel and communication, but most drivers won’t miss it, and will think the new, lighter offering to be a boon. On the whole, the new CR-V takes what the old one did well, and improves on the things that count. Specification-wise, it does however feel a bit bare-boned in its 2.0 litre form, amplified all the more by the equipment list rattled off by some of its keenest rivals, which have also become far sharper looking tools. So, you would think that the skies don’t look as clear for it as it did for the third-gen when it arrived on the scene, and the ability to remain the benchmark will be severely challenged by the likes of the CX-5 and, in the coming future, the Ford Kuga, with mastery of them no guarantee. But that would be without taking into account the badge behind the vehicle and the legacy gained by the third-gen RE. Taken under such consideration, the fourth-gen should continue cementing the appeal with buyers quite nicely. I have a perfect example of how this thought process is served, and it sits very close to home. Three years on, the other half is thinking of replacing her third-gen CR-V example, and I’ve been steering her to look at the possibility of exploring new avenues on the SUV path. Yet, when the time comes, I have more than a suspicion that its replacement will be its evolution, everything else be damned. Such is the clout then, and so, prepare to welcome the once and future king. Fresh? I don’t think so. Front looks like Kia Sportage. Rear looks like Toyota Avanza. Interior even worse, nothing good to say. Look at it please and that’s the fact! C’mon Honda, I beg you to come out the all refreshed design. yup..rear too avanza looking..which is UGLY. mato kau kero ko apo? ado ko koba belakang bontot eh mcm avanza…abah kau!x nampak mcm XC60 ko tu? Belakang dia macam Volvo SUV tu la ngok..!!! This car looks junk.Tiguan looks better. I’ll a fan of VW and own one,Tiguan is nice but is too expensive if compared to CRV! I must admit that the new CRV is so beautiful and improving! good job Honda. Yes, and don’t respond to Sam Loo below, don’t even click “like” or “dislike” , from NOW ON AND FOREVER. Since it has an improved real time AWD, can it perform soft roading better ? Compare it to CX-5 ,CR-V ground clearance seems too low might bottom from time to time. Apart from the 2nd generation, I was never much into the CRV. The last incarnation looked way too Korean for me, especially the strange shape of the tailgate.This new one looks more “sorted” to my eyes, although again if looks were to win the deal, the Sportage would get my vote. 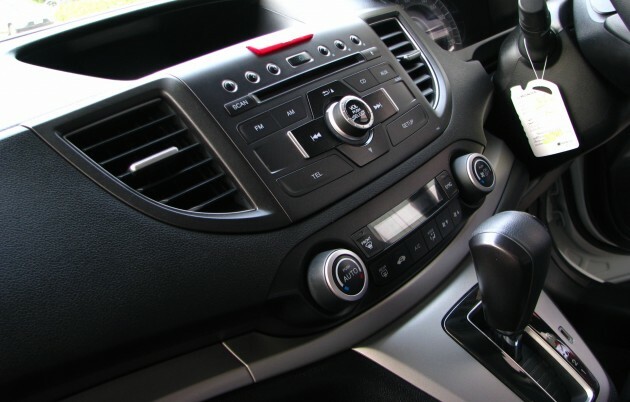 The lack of Bluetooth connectivity, DRL and stop start button suggest there were plenty of economic reasons that came along with the re-design. Yet I am sure it will sell well for the badge. thats because the industry now takes the koreans seriously and knows they are making some good looking cars. Couldn’t agree more with you. KIA is now not just design good-looking car, they have incoporate lots of german spec in it. Just look at the new Forte (cerato), the ceed, and the pro_ceed (going head to head with VW scirocco) designed by german engineer. Unfortunately, if ever the duty in this country abolished, the first to collapse are the Koreans and local made. Who will buy a Korean car when the Japanese cars are loaded with features and specs and sells at half the price they are selling now? I will. Korean cars are comparable to Japanese ones today. Duty notwithstanding, I find Korean cars likable and worthy for consideration. Unless you are a badge snob, in that case why consider Japanese? The Germans and English brands are more costly hence better for your esteem. You said japanese cars are loaded with features and specs? c’mon…toyota are always have lower specs than korean cars…and pricing is always higher.Malaysian are buying trend are depending on 2nd hand value, so japanese car make a success in malaysia..malaysian trend ba…noob one..
the badge helps a lot. but old crv a bit bigger(better leg room) than sportage/tucson Or others such as asx,3008. crv main strength is interior space. surprisingly u sed old crv looks to korean..but u prefer sportage? And easy to curi too, then you’re ‘hi lut’! We really should start compiling famous RV quotes from Sam Loo. Toyota should hire him to do some sort of TV advertistment. Only to have him standing infront of the camera and read out his many famous quotes. Who knows, it might go viral. Toyota will not entertain cheap quotes! Toyota success is new good quality and reliable product! No matter how hard SL praise Toyota come rain and shine! Toyota don’t give damn about his crap! Toyota survival not even depend on RV, but value for monies product! Too much under the belt misquotes from him. I think he need brain check-up, and send to Tg. Rambutan if the doctor found out it is the case! Ok will go to enjoy ur Hilux and pls lah Honda and Toyota RV r the same…ppl care about the looks,performance and safety so who care about the RV? can tapau? 10 years ago? Hilux kau tu buat angkut sampah je. Where is the DRL light bulbs? Plugged out already? Of coz I know that, but can’t you see all the images displayed, none of them shows DRL is lighted up. 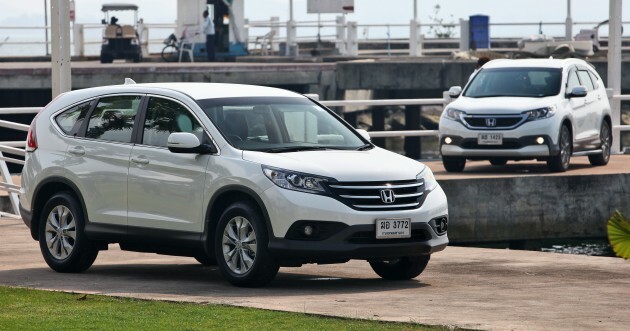 Honda Taiwan has removed DRL light bulbs from latest Honda CR-V model, in order to save the cost. I bet this will happen to Malaysia Models as well. There are no DRL units in the headlamps, it has been confirmed. Does the 2.4L comes with daytime running light 6 CD changer audio player ? oi…please change your name…you are noob…someday you may kill in accident in the car you are driving. The last gen wasn’t one of my favorite design. It has a gaping hole under the grill that I thought was stupid, it made the thing looked like a huge smiling face.This thou had a more balanced look and a very executive design feel to it. But I still don’t get that hump, though it doesn’t look too bad from the rear, up front 3/4 view it looks bad. the abscence of Bluetooth and DRL is forgivable, I prefer to use USB as Bluetooth just drains the phones battery and Empties it upon arrival of the destination, and Drl will just make that face even more aggressive. But what is not us the space between the console and the seats, that’s the one of the few features in my Alza that I liked and it is brilliant. Contrary to the writer, I think the interior is one of the standing design that is up to par if not better than its rival. The dashboard layout just has a modern and balance design, contrary to the generic of the previous and chaos of the civic, insight and CRZ. But two things caught my attention, the improve NVH, Honda doesn’t really gets good praise on this part so it’s interesting to see how nice. The other thing is the arrival of the Ford Kuga, that may easily blow its competitors away. But the CRV is definitely a overall improvement from the last in looks. But it’s not heads over the competitors anymore, not with the cx5 and sportedge, but it makes a fair fight. I just realize I got carried away and wrote almost a full review on my phone. That said, in terms of exterior looks, sadly the CX-5 gets my vote, the CRV ruins it with that hump, otherwise it would be my choice. But I still hold my opinion that the front resembles a Sportedge older, matured sibling. And the interior is still one the best, for its balance and simple while modern design. Now I have to face the all ‘it will sell because of badge’ fiasco. good on you, AVH. I think this CR-V is gonna sell like hot cakes again. CX-5 is not very good looking, especially with that teeny-weeny 17 inchers. they look very ordinary compare to the 19 inchers the car used to wear. Wow with all the Geneva post coming in, this is beginning to be berried in the archives. 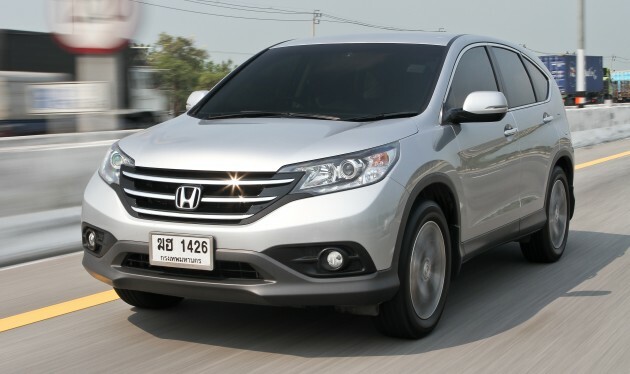 Anyways, the CRV is going to sell because is contemporary looking and appeal to people in the 40s onward. My parents once sat in a Prius C and disliked it for having too many buttons. IMO, The CX-5 still looks good even with the 17s, and I got a feeling for all my praise of the Honda, people think that I dislike the CX-5. No the CX-5 would be my choice if I’am buying with my money(If I had that much), It’s more tech laden and I state before, better looking. The CRV appeal like my parents (or above 40) because it’s still of decent quality, it’s much more contemporary looking inside and outside than a CX-5, and most importantly, it’s tall. It’s a no-fuss car second only to Toyota. If you want a car that fits your description it will be the Hyundai Tucson. The wheels looks so small on that ridiculous fluidic design body. And with less airbags and similar performance than the more handsome, Sportedge, I don’t get why people like it out sells it. The other thing I don’t get is the unnecessary hate. Like KIA = killed in accident up there, they just hate it because is a Kia, and even more people up there, just because it dosen’t have this or that of a Korean and wears a upright H is the worst car ever. Unnecessary prejudice. anything by Toyota and Honda, I don’t support. overpriced and under-spec. I saw it on the spec list, that this car has a remote start in the 2.0 model, how true is it? And how much is the GPS? Those who keep criticizing Korean make cars are probably those who doesn’t understand the meaning of ‘Value for money’ and probably that have no idea that the Korean brands such as Kia and Hyundai are now major players in the automotive industry. Their vehicles are steadily capturing the markets previously dominated by the Japs and the Japs are now struggling to cope with the new competition. Buyers who are driving these new generation of Korean vehicles are enjoying more car for their money. While those who continue to resist the obvious, will just have to be contented with driving the boring and under spec vehicles produced by the Japs and are obviuosly in denial of the fact that the Japs have now been left behind in terms of design and specifications. These Japanese car fans just don’t know what they are missing out! Boring? Under spec? Do you think Mazda CX-5 fits in here? I can see Mazda CX-5 clearly leading this crossover category now. Best in term of spec, technology and Japanese reliability. Pity you as I read your comment. ok la ok la, Kimchi is the best! BEST! to quickly correct you, those who condemn and criticize Koreans cars are feeling threatened by Korean Cars, They understand Value for money, but they cannot accept the fact that Koreans are better now. They can see it happening, but they are lying to themselves, no matter what Koreans do they are not near Japanese. They are the kind of people living in their world, ignore them. These are frightened people trying to prove something which is no more valid in today’s world. But they themselves probably own a Samsung house hold product. Korean cars ARE not better now. Otherwise they would not have loaded in with so many specs and yet selling it cheaper. And that’s business. AVH make a good point there where koreans can throw in all kinds of gimmicks. Thats all. Korean products are clearly not reliable and I m talking thru experience as well. From electronics to automotive their product can’t last. It sells because people like fancy and gadgetry. You can’t compare electronic items with car. I don’t mind getting a Samsung phone even if it doesn’t last for more than a year. I can afford to change and new features change very fast. Buying a car is completely a different matter. I can’t change my car every year. Koreans are still way behind in term of refinement and handling. I can see why you wrote such comments, KIA = killed in accident is also giving me headache. But you have to understand, with the exception of Mazda, the level of hate for Japanese brands is way higher especially in PaulTan. I know owners of Korean cars enjoying more car for their money, but I can’t help but fall for the fact that ownership experience might be hell, the service and spares after the 3rd year. The Koreans are not supreme and has their negatives , and the same goes for the Japanese. Some people like sonyman may state that Koreans are better because they are capturing the consumer of the once dominant Japanese consumer products sector. But When compare Tv to Tv, Sharp TVs has a better picture quality of any Samsung, both from mine and international opinion. But the Samsung is loaded with gimmicks. A Nokia Lumia has a better quality built and longevity than a Samsung phone but hey! the Samsung has more features. The Koreans are excellent at selling more stuff for less, which gets buyer like you. But when explaining this to actual people who buys car, all they want is a reliable motor to get you from point A to B with relative comfort and easy to drive, and this is where the Japanese excel. It’s not that it’s more reliable, it’s more fuss-free and that’s almost whats matter. A Golf sells more in Europe and a Camry sells well in US, both places where a similarly priced Citroen and Ford has more features and better performance. Because Toyota and VW knows how to offer a excellent car and nothing more. I still don’t understand where do you get that gospel that korean cars might be problematic after 3 years. I have seen enough korean cars that are as reliable as japs and perhaps you have been getting your points from those korean haters, or ppl like sam loo. Haha, nope, just a personal hunch. Partly because I’ve haave the unfortunate luck to mix around owners of more than 4 year old Korean cars and the story isn’t pleasing. I know they are as reliable, I just have’t have the enough personal sources. And i did state, I treat both the japs and Kor on par, they have their own strong and weak. SamLoo? nah the Joker is a Toyota and only Toyota. But if you view my comment as one sided, than maybe you’re right. An ill encounter with a K-pop fan, who said Samsung are better because some K-pop star uses it. It did affect my state of thoughts on Samsungs for a while..
i admired Korean cars in terms of its DESIGN. However .. ur statement VALUE FOR MONEY made me wonder .. is it true ? Ive been told by the insurance co. that the value of Korean cars depreciate the most followed by NAZA .. especially those look-like Korean models; such as NAZA CITRA to be in particular. Value for money not mean resale value…Your whole life just care about resale value? buying a car because of resale value, then it is pity you wont ever drive a fun car. I now trade kimchis, as it is very profitable. Standard trade in value is 50% off within 1 year. Those who keep criticizing Korean make cars are probably those who doesn’t understand the meaning of ‘Value for money’ and probably they have no idea that the Korean brands such as Kia and Hyundai are now major players in the automotive industry. Their vehicles are steadily capturing the markets previously dominated by the Japs and the Japs are now struggling to cope with the new competition. Buyers who are driving these new generation of Korean vehicles are enjoying more car for their money. While those who continue to resist the obvious, will just have to be contented with driving the boring and under spec vehicles produced by the Japs and are obviuosly in denial of the fact that the Japs have now been left behind in terms of design and specifications. These Japanese car fans just don’t know what they are missing out! Yes, just like Samsung LED/LCD beat Sony flat now! Not to mentioned about Samsung Galaxy smartphone. However, for car, in term of branding, T & H still way ahead! Good looking car! It will sell well no matter what people said in this PT Blog! good looking car from the picture but the interior is quite a disappointment, korean is way better and better equipped .I have the current 2008 accord for myself and 2012 kia optima k5 for my wife, i could say the korean is fast improving it quality and its design. My honda is much more expensive than the kia but it not even have basic trip computer. After that, Toy ota launch a new camry with the similar features with k5.. 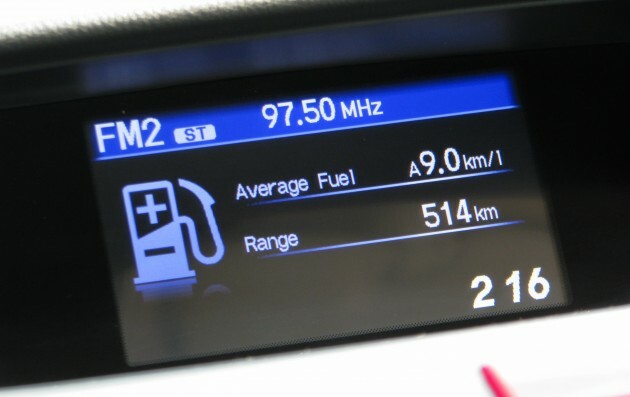 Even with this new design, the fuel consumption is still not good at +11L/100km (2.4) and +10L/100km (2.0). For comparison, my 10 years old Citroen Evasion @ 10L/100km. just like top gear test Kia Cee’d and Sportage. 9 KM per Litter? WOW! Drinks like a camel!!! Bro it consider ok while my dad X-Trail drink more fuel den it ……. it just hopeless !! 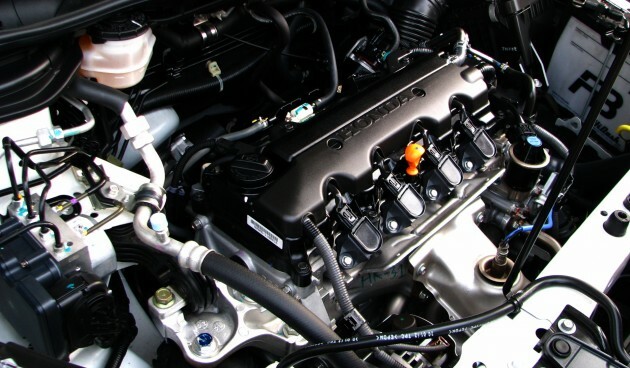 that size,that weight,and a 2litre doesnt sound adequate…too bad honda doesnt have a small displacement turbo yet…. 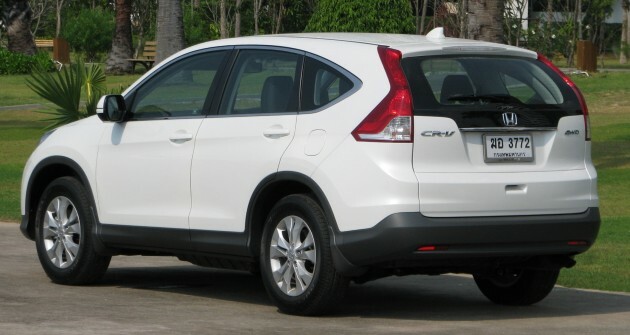 The New CRV design is Nice !. Going to change to this new model. i driving 2008 accord now. 190k for 2.4 version. no thanks. The people dislike your comment probably are Japs car fans again..They keep believe that T&H are the best, don’t want to admit the overpriced and under spec matter,because their see car as investment. They are too scare too switch to korean car because of resale value. Many of my friend owning a Japs car before and now buying a korean car..They said very impressive with the performance and comfort can be compete with japs too. The rear side is still following the design of Volvo XC60. When Volvo changes the tail lights to be more curvy, CRV also follows it. This new generation is more like a facelift model. Hopefully the next generation will have all new design. Korean cars will ovetake Japanese cars just like what happened to Samsung overtaking Sony & Panasonic in the consumer electronic market, KPOP & Korean TV series overtaking Japanese songs & TV series. No one can deny that by saying it won’t happen. New thinking, new possibilities. Wow!! this car is awesome, now who want my old Hyundai Santa Fe. 4 year old Santa Fe 2.2CRDi trades in for RM50k, selling around RM65k. Easy RM15k gain for used car fella. 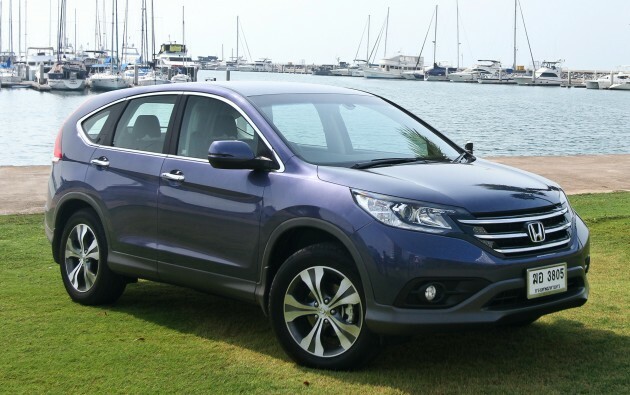 CRV DNA’s is unchanged.Cosmetic surgery did well and look better than previous model. Otherwise it will lost momentum as SUV market more stiff from Korean rival. 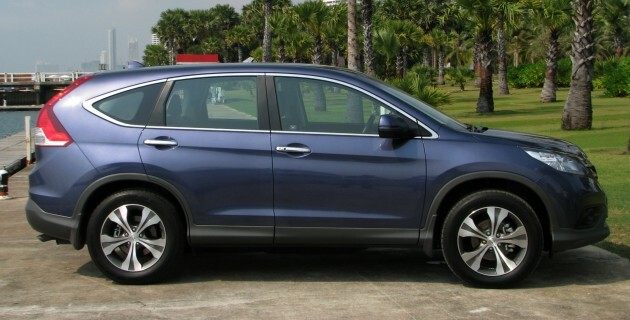 Overall, CRV engine is better but rear exterior look ugly as front is well redefined. i dunno which one to get… CRV or CX5?! will CRV still under power like the last model? If want resale value go for CRV! Nothing already! As a comparison the vw little 1.4 TSI can do 160PS at 4,500rpm and more important its peak torque of 240nm from 1,500rpm. $149k price tag is fair if compared to option available in market. Although performance bit lag but if u want better performance u can always choose Tiguan or Santa Fe if u could afford it. this car suits for those veterans more. the interior is simple not too hi-tech/modern. if ure 25-39 i dont think wud buy this kinda car right ? I just stumble upon these blogs by Paul Tan, admittedly highly interesting. Even more interesting to read are the comments after the article/review..
Fresh from reading Top Gear review (the team said this CRV is boringly average) in my “quest” to buy a third car, an SUV — I went to test drive the CRV by the rather surprisingly friendly Honda sales people. And how true it was, way underpowered. And rather ugly rear. Thinking of Santa Fe now as I agree RV should be a small issue. Look at cars of any brands over 10 years … any model can fetch real good RV? A 2002 Camry can hardly sell for RM30k. I just bought Honda CR-v 2.0L, overall it is quite impress in term of the body size and driving. However, as everyone mention here, it is true under power for 2.0L. Now, something really make me disappointed is their Authorize Service Center where I went service for my first 1000KM @ Ipoh Jalan Kangsar Honda brand. Before I sent in my car for servicing, everything look good condition. But, after 2 hours serviced while I get ready to collect my car, I spotted the Key or rather steering cover is open (gap). When I ask the Service adviser, he told me that I have to go back to my original purchase brand to fix this (Klang Lama). Furthermore, there is a scroll near front Tyre bumper drop off. They don’t even bother to offer fixing. Sad! So Bro’, I appreciate if someone of you can share your experience on this area.